List of all Work in Progress (WIP) Painting posts is here. Andy’s Sculpting WIP thread on Reaper is here. 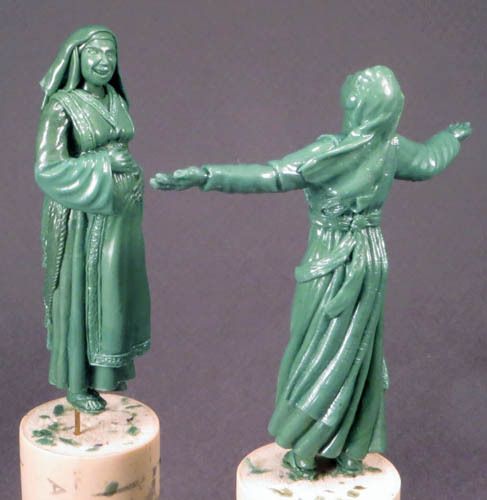 Thank you to Derek Schubert for his help with Elizabeth’s face, and for meeting with me for an hour in person to talk minis this past September. 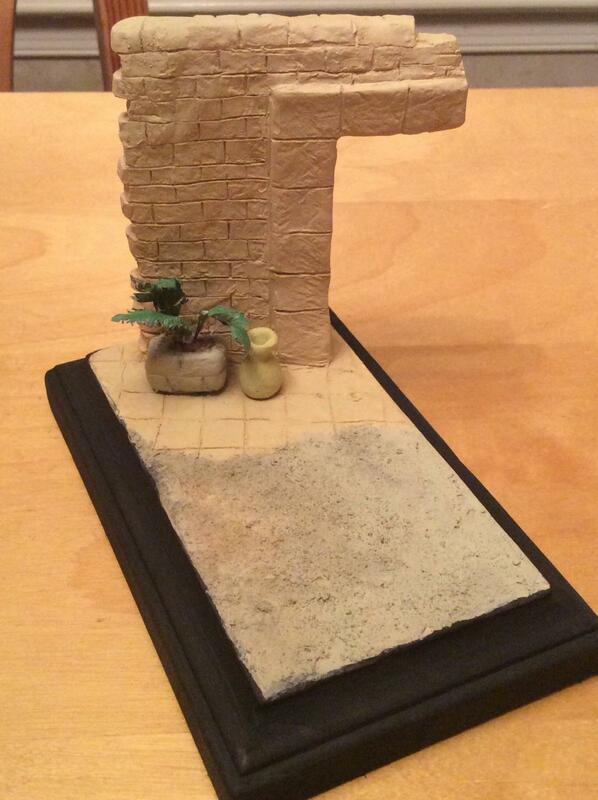 Thank you to Andy Pieper (TalespinnerMinis.com) for a beautiful sculpt. Thank you to Our Lady for the inspiration for this project, my Mother, on whom our Lord has indeed looked with great favor. 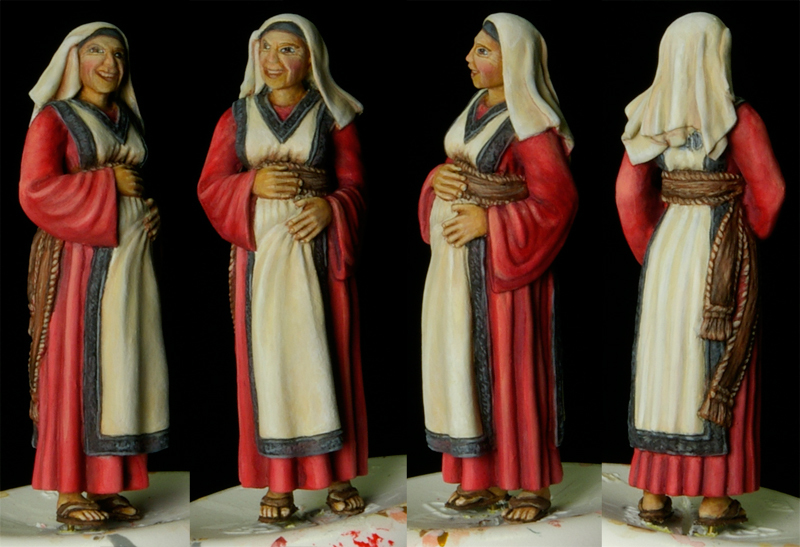 Blessed are you among women, and blessed is the fruit of your womb! This weekend I had the honor of meeting one of my favorite sculptor/painters, the very talented Mr. Derek Schubert. Derek was going to be in Arlington, and he remembered that I lived in VA, so he invited me to meet with him. I brought my display box of miniatures and we talked for about an hour about all things minis. 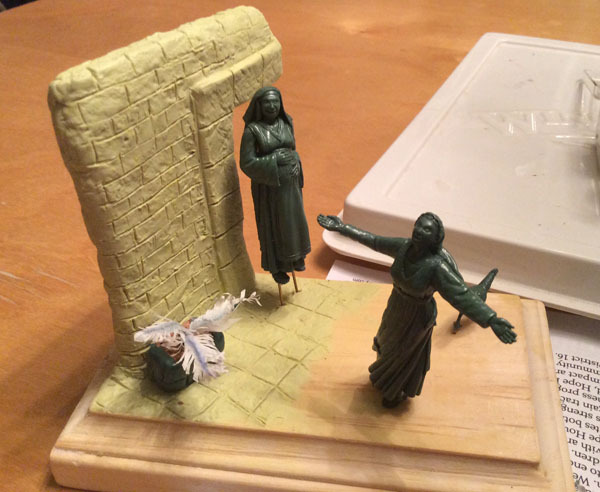 Derek gave me some thoughtful critiques and ideas for my current project, like producing a sort of OSL effect on the wall behind Elizabeth to both similuate a halo for the Saint, and to draw the viewer’s attention to the mini. 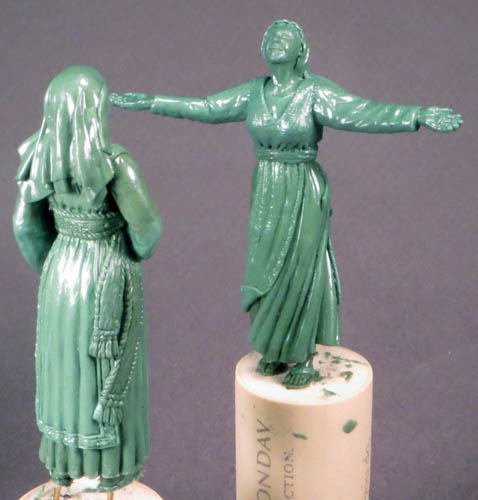 He also suggested lower contrast on all elements of the base as another technique to attract the eye to the figures. He showed me a Reaper Bones mini he recently speed-painted. We discussed Derek’s speed-painting methods, including how he often base coats with a highlight and shade where appropriate, instead of with a midtone over the whole area. This saves you some steps in the process, and therefore time. Another really neat trick for painting in general that he uses to unify a figure is to paint the same color for the highest highlight on all parts of the miniature, as if a same-colored light were shining on it. I will definitely try that! We talked about some of our shared experiences, like how we sometimes take a break from the hobby, usually when some other creative outlet comes up that piques our interest for a while. I related how I pretty much stopped painting for a couple months when I got my sewing machine for Christmas last year. 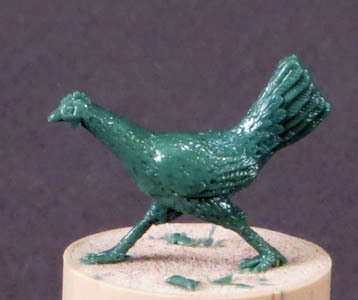 We also both agreed that we generally produce better painted miniatures if we plan out the color palette ahead of time. Derek showed me photos of a few color studies he did for some of his pieces before starting them. ReaperCon came up, but only briefly. I told him how difficult it is to make it to Dallas-Ft. Worth during the school year, especially since I’d want to take my husband with me. I travel for work sometimes, and I have to leave Dave on his own with our kids. I wouldn’t want to ask him to do that just so I can run off to a mini painting convention. Maybe in 6-8 years my kids will be mature enough to stay home alone for a few days. In the meantime, I will attend vicariously through the Reaper Message Boards, and meet people one at a time as the opportunities present themselves. It was a great experience for me, and I’m humbled and so very grateful that such a talented artist would think of me, invite me to meet with him, and take the time to talk to me one-on-one about miniature painting. Thank you, Derek! I think I’m done with Elizabeth. I worked on her for about 2 hours last night. I need to take some time away, then go back for a second look. Sometimes when you’ve been starting at a miniature for a while, stepping away, then coming back, can give you insights you didn’t have before. Looking at the photos, I think the black edging could probably use some improvement, though I’m not sure yet how I’ll do that. So I’m not ready to call her definitely done yet, but she’s very close. I painted Elizabeth’s face. 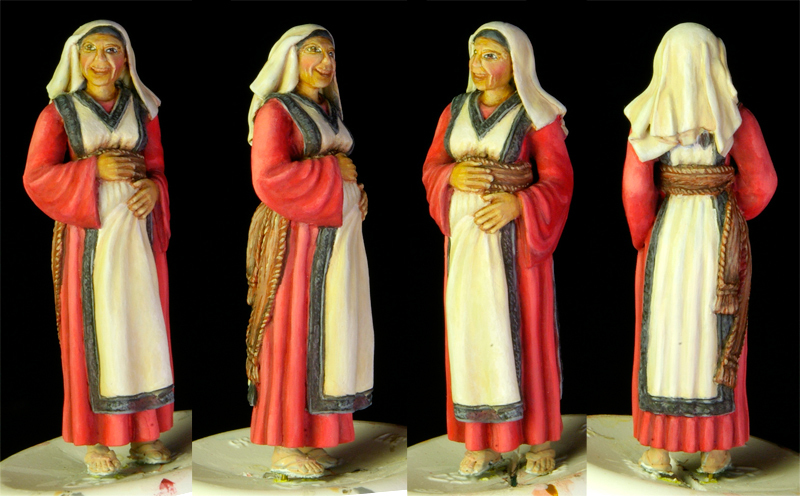 The primer and paint filled in her wrinkles, which I thought might happen, because they are so very subtle. I had to freehand them on. 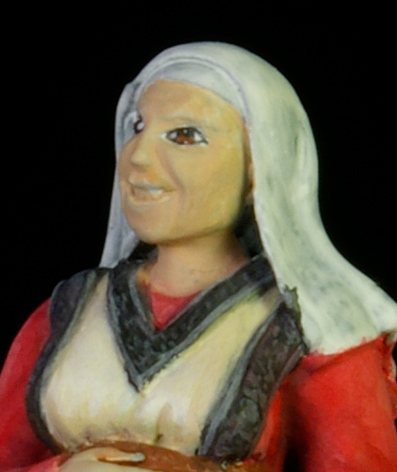 I think it looks pretty good, though she needs more highlighting, especially around the eyes. Smiling expressions are difficult. If the eyes aren’t right, the smile looks forced. I also worked on the white fabric, black trim, and the brown belt. I still want to put more time in on the red, because it doesn’t look done yet to me, but I didn’t touch it recently. I pulled out my Milliput and fixed the left corner of the wall. I used what was left to sculpt the vase/pot thing. Daughter R: What is that? Me: That’s what it is. R: Oh, you’re good at pottery. Haha! Get it? I took my dremel to the edges of the wall to sand them straight. Then I cut away some of the bricks so their individuality is more apparent, and also to avoid the implication that the edge was the actual end of the wall, not just the edge of the scene. My husband thinks it looks bombed out now, so maybe I went too far? 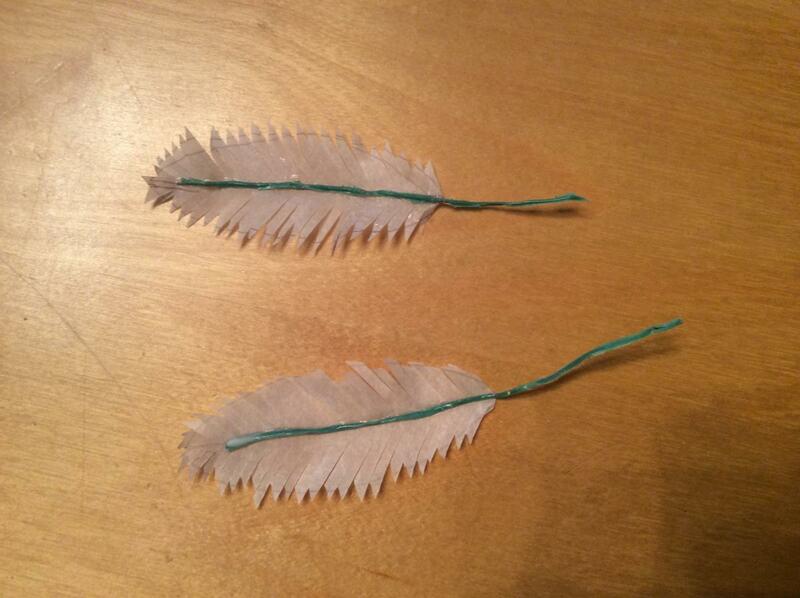 For the dirt, I used a mix of watered-down craft glue, flour, and sand. 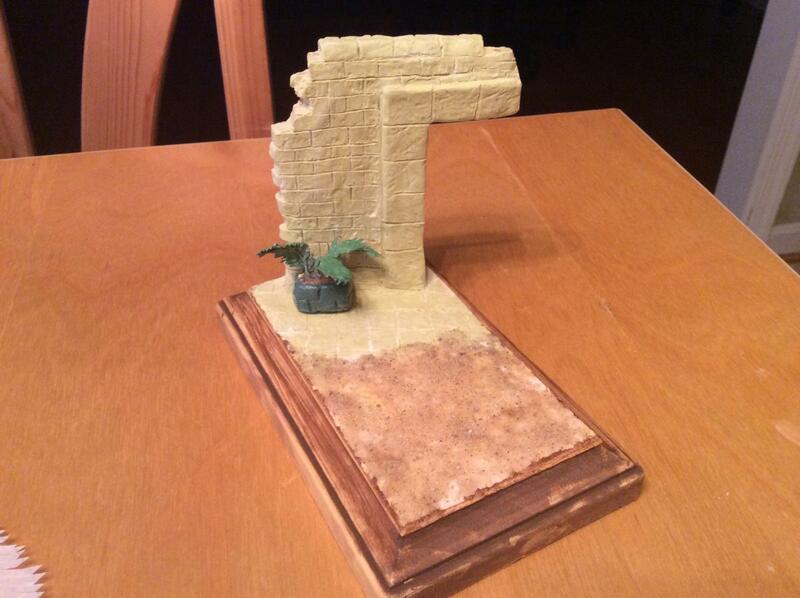 I put sand in the planter, and primed and base coated the foliage. Then I stained the base, which looks horrible. I must have gotten putty and/or glue on the wood in a few places, because the stain went on really blotchy. It’s also just really soft cheap wood. I’ll paint over it later. I thought the plant leaves turned out well enough, so I made a couple large ones that can hang over the wall, like there’s a palm tree that leans over the house. I’ll paint them and see how they look before gluing them on. 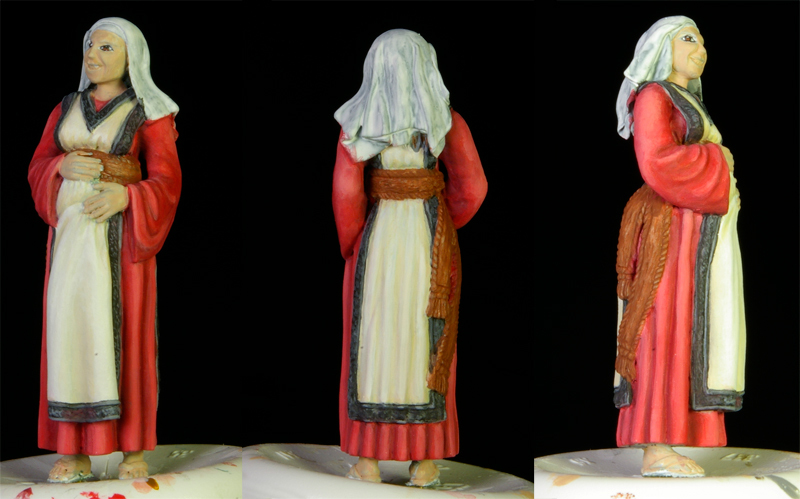 For Christmas last year, my Mom hired the very talented Andy Pieper (a good friend of mine) to sculpt me a set of miniatures for a Visitation Scene from Luke, Chapter 1 of the Bible. 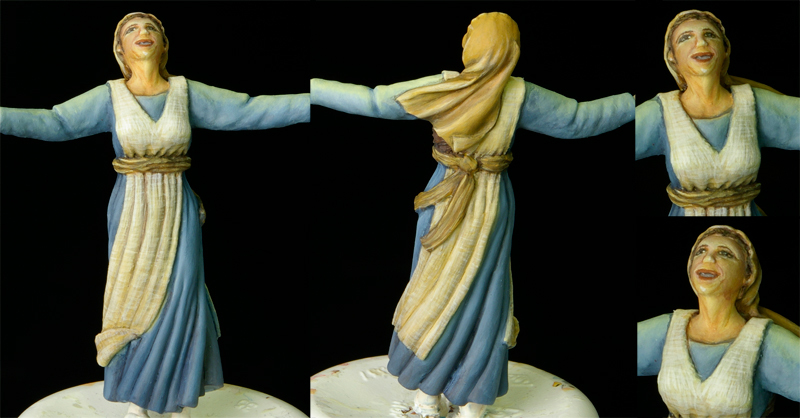 Andy’s Sculpting WIP thread on the Reaper Message Boards is here. 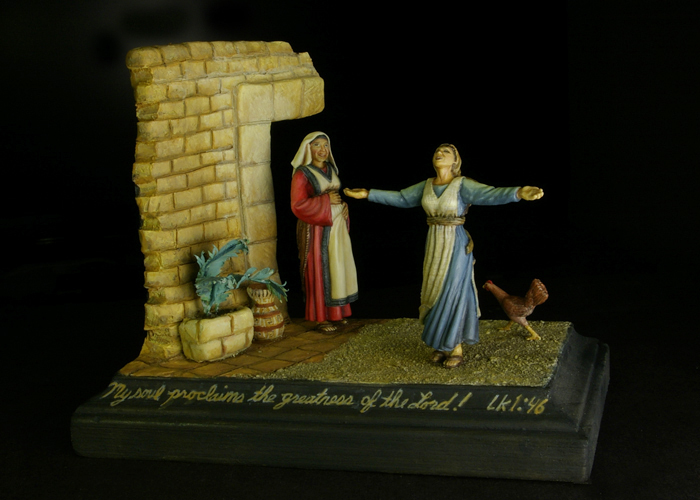 This diorama is meant to represent that moment, as Mary twirls and sings for joy in the yard of her cousin’s home. 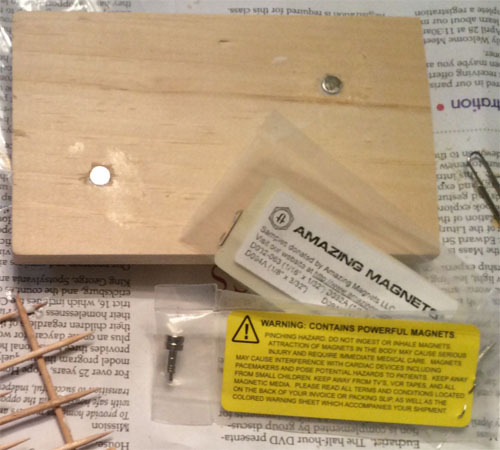 I started by purchasing a wooden plaque at Hobby Lobby, sanding the bevels, and installing rare earth magnets in the base, so it will stick to the inside of my wooden miniature carrying case. 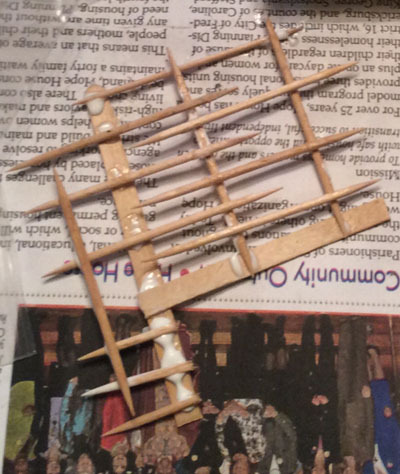 I knew I wanted the wall of Elizabeth’s home on the edge of the diorama, so I glued together a frame out of coffee stirrers and toothpicks. I let that dry overnight, then used Milliput to build the basic shape around the frame, which I also left to dry overnight. When I got out the miniatures to place them in the scene, I realized my wall was angled the wrong way, so I ripped it off the base and respositioned it. Then I added another layer of Milliput over the shaped wall for sculpting the stones. I also used some Milliput for a tiled floor, which peters out into the farm yard. 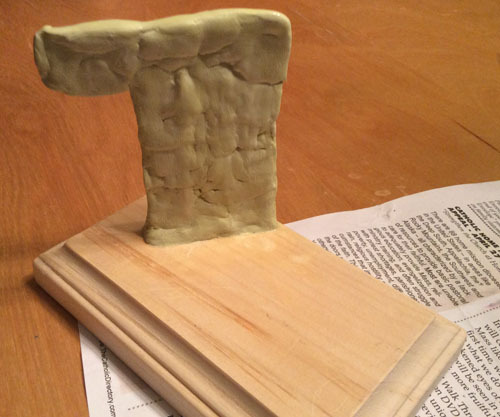 I’m going to put down something for dirt, but I’m letting the putty dry first. I created some palm-like leaves out of twist ties and parchment paper, and pushed them into a piece of cork, which I wrapped with green stuff for a planter. I plan to fill in the top with sand. 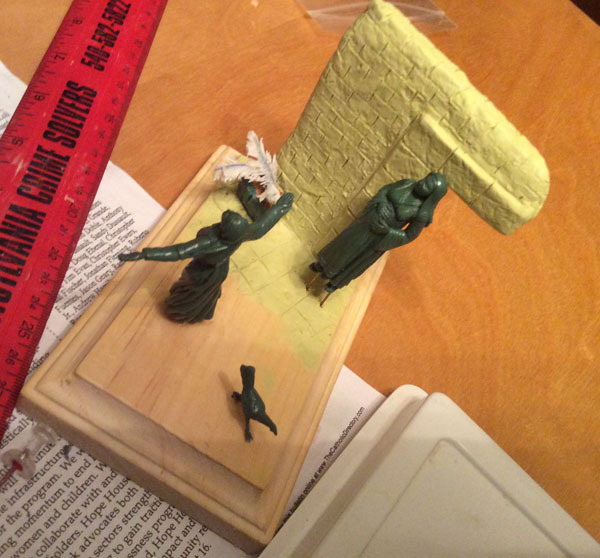 Here are two photos of what’s done so far, with the miniatures in their places, though of course not glued down (and Elizabeth won’t be flying in the air like that!). I’m thinking of making some larger palms hanging over the edge of the wall, though I’m not sure how I’d attach them, and I kind of want to see how the little ones look once they’re painted. If they’re not convincing, I won’t bother with larger ones.